You can’t just throw water on a grease fire. You need to eliminate the fuel source and smother the flames in order to get a kitchen fire under control. 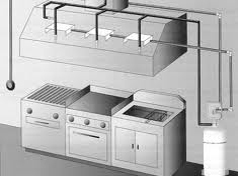 Fire Solutions NW’s kitchen fire suppression installation and service maintains your system so it acts as it is designed — effectively and reliably and in compliance with the UL 300 standard. Fire Solutions NW will design, install and routinely inspect your kitchen fire suppression system. Fire Solutions NW will service only kitchen systems that are UL 300 compliant because a dry chemical system or a system that does not comply with the UL 300 standard may pose an immediate and serious safety concern for your establishment. Don’t let a kitchen fire become a recipe for disaster.